Matthias Pasor (Herborn 1599 - Groningen 1658) was a professor at the University of Groningen from 1629 till 1658. 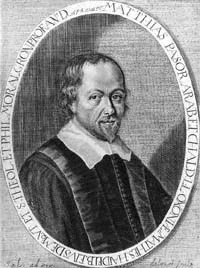 Matthias Pasor, mathematician, linguist, philosopher and theologian, was born on 12 April 1599 at Herborn (county of Nassau, near Dillenburg, in the present Germany). He was the first son of Apollonia Hendsch (d. 1614), daughter of a Herborn senator, and of Georg Pasor (1570-1637), a philologist and private teacher, who later became professor of Greek and Hebrew at the university of Herborn and in 1626 professor of Greek at the university of Franeker (Friesland, Netherlands). He had a younger brother Johann Jacob, who survived him. When, as a young child, he had recovered from a serious fall, his parents made a vow that he should be a minister. He received the respective education, which started with the gymnasium at Herborn and later, because of the plague, at Siegen. At the age of 13, so is reported in the first biography that we have of him (Effigies et Vitae, 109-111), he had good command of Latin, Greek and Hebrew, and was allowed to attend public lectures. He received his Masters Degree in Philosophy in Heidelberg, 20 February 1617, where he matriculated 13 April 1616 after having studied at Herborn and Marburg (1614). In the Heidelberg faculty of theology, where he matriculated 27 May 1616, he studied with Paraeus, Coppenius, Scultetus and Alting. He combined his studies with giving private lectures in philosophy. His good reputation in these led, in 1619, to his appointment as extraordinary professor of natural philosophy. In April 1620 he was offered the chair of mathematics, which Jungnitius had given up for the chair of physics. He acccepted, and functioned from May 1620 until he left Heidelberg, on 6 September 1622, when the town was sacked by the Bavarian army. Without any possessions he arrived in October in his hometown Herborn, where he took up again his private lectures in philosophy and theology. In the early spring of 1624 the ongoing civil war made him fly abroad, first for a month to Leyden, where he heard lectures in theology, and discussed with the arabist Erpenius and the mathematician Willebrord Snell. Then he moved to Oxford, where he was incorporated as Master of Arts 5 June 1624, because of his Heidelberg degree. Here too he started to give private lectures, in Hebrew and mathematics. By the end of the year he accompanied, as private teacher of mathematics, a couple of Hamburg students on their tour to Paris. Paris offered him the possibility of studying Arab and Syrian with Sinonita, the Lebanese professor of oriental languages and Royal interpreter. At the end of spring 1625 he returned to Oxford, which was by that time haunted by the plague, and settled in Exeter College, where he continued his studies and private teaching. In 1626 he was offered the chair of oriental languages, which he accepted on 25 October with an Oratio pro Linguæ Arabicæ Professione , publice ad Academicos habita in schola Theologica Universitatis Oxoniensis (publ. Oxford 1627), and which he later combined with lectures in Hebrew at St. Mary's College. The appointment enabled him to decline the invitation of the Irish bisshop James Ussher to come to Ireland. Pasor lectured in Oxford until he was invited, 16 February 1629, for the chair of moral philosophy at the university of Groningen (Netherlands, founded 1614). He accepted and stayed in Groningen when, later in 1629, the Athenaeum at Deventer (Netherlands) offered him a position with profitable conditions. On 16 February 1635 he signed an agreement to also teach two weekly hours of mathematics, next to his four hours of philosophy. The chair of mathematics had become vacant with the death of the first Groningen professor of mathematics Mulerius (1564-1630). Pasor also promised not to leave the university for the next six years. In 1645 Pasor used an invitation by the university of Harderwijk (Netherlands) for the chair of theology and Hebrew to change in Groningen from mathematics, for which a separate chair was established, to theology. Three days after he had received, on 24 October 1645, his doctorate in theology, he started his teaching, still in combination with moral philosophy, although on 14 september 1647 he requested to be relieved from these. Pasor was reluctant to publish. An older biography (Ersch and Gruber, Section 3, vol. 13, i.v.) quotes him from a source that could not be retraced, that he did not publish himself, since he did not want to keep the youth from reading better books than his. His testament reveals that the notes were written under time pressure in a tumultuous state. They should be kept by the Groningen Rector Magnificus and Professors of Theology. If his heirs (his family in Germany, i.e. his younger brother and the two children of the latter, Anna Margaretha and Matthias) should be unable to administer his rich estate, which included a large house in Groningen and possessions at Herborn, it should be used to establish three new chairs (Professiones Pasorianae) at the university of Herborn. The respective professors, one in theology, one in theology combined with Hebrew and one in ethics combined with Greek, were then expected to edit and publish his notes in theology, ethics and mathematics. Although Pasor did not publish work of his own, he he gave considerable efforts to postumously publish linguistic work by his father. There also exists a long series of printed disputations which were defended under his presidency (31 in Groningen University Library, 1 different from these in the British Library, a list and global discussion is in Dibon 1950) in the years 1646-1652. They deal with theology (a.o. about eternal life, free will, heretics, Jews, Mosaic law) and ethics. No traces of mathematical work have been found. At Groningen he took part in the general duties. So, in 1644 he was secretary of the senate, and one of the few complete lists of registered students is of his hand. In the discussions about Cartesianism he took a position which was moderately supportive of Descartes, who had complained to the senate about one of Pasor's colleagues, the philosopher Schoock. On 26 May 1645 Descartes wrote to Pasor, thanking him for his help related to the favourable judicium of the senate of 10 april (correspondence in Œuvres de Descartes vol. 4). Furthermore he contributed with some biographies to the collection of biographies and portraits of Groningen professors Effigies et Vitae (1654). Very probably he supplied his own biography, which is the main source of all later biographies, this one included, and which accurately fits with all data that could be verified independently. The Programma Fun�bre, in which his death (28 January 1658) and burial are announced, depicts Pasor as a strong, independent man, who never married, incorruptible, pious and peaceful, a good colleague, a faithful friend and well-liked by all. On 4 February his body was carried from his house in the Oude Boteringestraat (presently Nr. 65) to the nearby Academy Church, where he was buried. His family inherited his estate, so there were no Pasorian professors to publish his works.